Before the watch aficionados lose their hats about this poser of a watch brand, let me just say that the KC8100 is a little more than just a gussied-up case wrapped around a cheap generic quartz module. 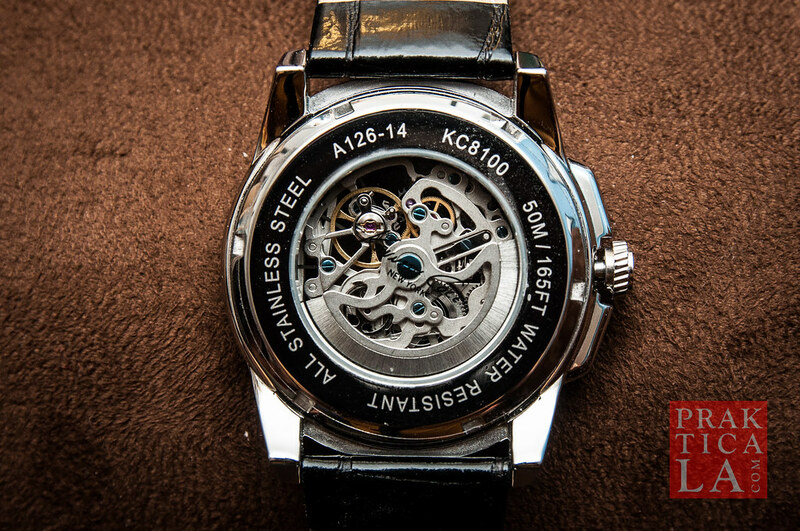 It has an actual automatic movement, featuring a sharp, unique look, and is a lot more legit than you think. It’s still made in China though. The draw for Kenneth Cole watches is the “bold” styling that they bring to their pieces. On the KC8100, the dial is flanked by big honkin’ Roman numerals at 3 and 9 o’clock. Pretty cool. Watch snob or not, you gotta admit this is kinda cool. The remaining hours on the dial are marked by slim silver bars. For some reason, the minute indicators are denoted in intervals of three. Shrug. 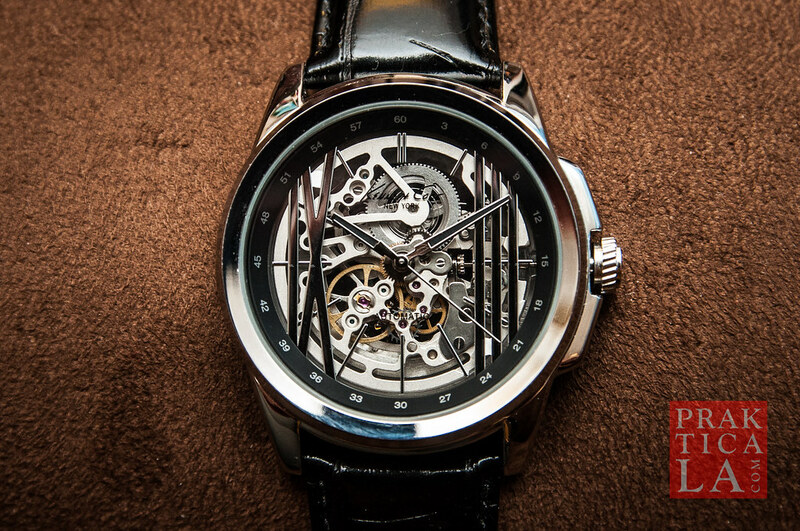 The rest of the dial is skeletonized, so you can see the movement’s spinning cogs and springs either through the face, or through the exhibition caseback. It’s fun to watch the gears of the clockwork ticking, especially if you’re bored and have nothing better to do, like when you’re, say, in the middle of class. All this fanciness makes it rather hard to actually tell the time. This watch doesn’t even have a day or date function. More often than not you’ll probably just glance at your wrist as if you have somewhere important to be, stare puzzlingly at it for a moment as you try to decipher what the hell time it is, then whip out your cell phone to check. Oh well, you’re not wearing this bad boy to tell time anyway (that’s what my Seiko is for). You wear this gaudy bauble for the attention, duh! As for the functionality: the watch is automatic, so the rotor spins and winds the mechanism using the natural movements of your arm. 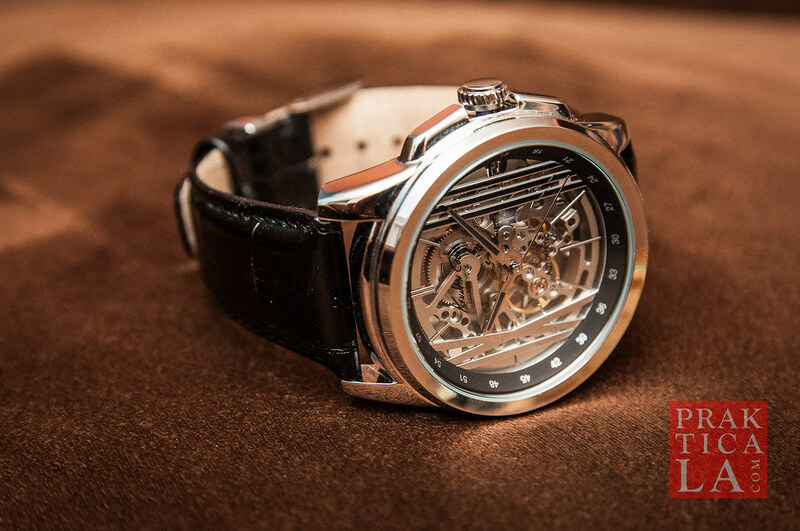 However, many watches still allow additional, manual winding, which is accomplished by turning the crown clockwise while it is in its lowest (default) position. I was surprised that the KC8100 could actually do this; most non-luxury automatics (including my Seiko) cannot. It’s a nice feature to have if you want to keep the power reserve running when you aren’t wearing the watch for a couple of days. The strap is “genuine leather” and looks decent enough, although it started to wrinkle and crease after the first use. Bottom line: This isn’t a luxury piece by any means, and watch snobs will scoff at you if they catch you wearing it. If you can get over that, this is a cool-looking automatic watch that is a great conversation-starter for normal people. It can be purchased at Macy’s, among other places. What do you think? What are your favorite watches? Leave a comment below! P.S. I will have some actual legit watches here in the near future. Also note: The Kenneth Cole brand has three separate lines that bear its name: Kenneth Cole New York, the original and best quality; Kenneth Cole Reaction, which is a less expensive, lower quality line of clothing; and Kenneth Cole Unlisted, the brand’s cheapest and lowest tier.